There is certainly no denying that Dallas is a huge city and many hotels here target business visitors, with subsequent weekend specials to entice tourists looking for a short break. Do bear in mind that during major conferences and events, such as the popular State Fair of Texas (late September to late October), accommodation in Dallas is in great demand, meaning that lodging rates rise accordingly. Nearby Fort Worth is a good place to look for Texan accommodation, while also close to Dallas, further hotels reside within neighboring towns and cities such as Balch Springs, Duncanville, Farmers Branch, Hutchins and Irving. Hotels within the downtown district are well-placed for accessing the Dallas Convention Center on South Griffin Street, which comes with an arena capable of seating just under 10,000 people. 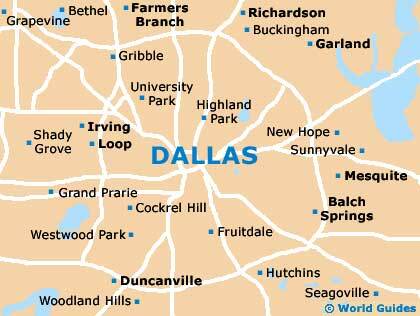 There is also an array of cheap accommodation situated near to the Dallas Fort Worth International Airport (DFW). Located on the International Parkway is the Great Hyatt DFW Hotel, which is actually integrated with the airport's International Terminal D and comes with its very own rooftop swimming pool and fitness center. Close by and recently upgraded at the cost of more than $40 million is the Hyatt Regency DFW Hotel, which really does stand out from the crowd and boasts two separate restaurants, including a steakhouse. There are also further budget hotels residing around the Love Field Airport and along the Stemmons Freeway. Those who prefer to camp may like to check out the nearby camping sites, such as the scenic Lake Park on the Kingfisher Trail. If you are looking for budget accommodation in Dallas and are prepared to compromise on location, then consider the motels along Fort Worth Avenue, although this selection really isn't terribly appealing, just extremely cheap. 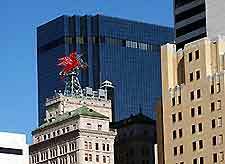 Most visitors prefer to stay in downtown Dallas or within the Uptown area, where hotels are well-placed, although fairly pricey. 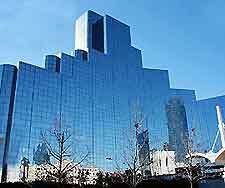 Popular mid-range lodging includes the downtown Sheraton Dallas Hotel on North Olive Street, which enjoys a central setting within the Arts and Financial district, where it is connected to the Plaza of the Americas complex by a sky-bridge. 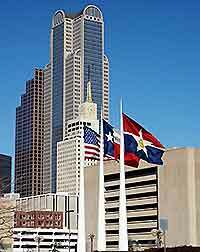 Also within the downtown district is the Best Western on the Market Center Boulevard, in the Dallas Market Center. Surprisingly often very affordable is the four-star Hilton Lincoln Centre, which stands at the junction of the North Dallas Tollway and the LBJ Freeway US-635, within the Galleria area of the city. Luxury hotels in Dallas are generally concentrated around the city center and along Commerce Street, Crescent Court, East Lookout Drive, the Freeport Parkway, Leonard Street, the North Stemmons Freeway, the Reunion Boulevard and on the Turtle Creek Boulevard. Commerce Street is where you will discover the opulent Adolphus Hotel, which was established in 1912 and is known for its downtown location, spacious accommodation and award-winning 'French Room' restaurant. Somewhat more pricey in Dallas is the Ritz Carlton on McKinney Avenue, and the Rosewood Mansion on the Turtle Creek Boulevard, both of which suit those wishing to splash out and savor some truly luxurious surroundings.